Films about famous painters have always proven a challenge for filmmakers to connect with audiences. Julian Schnabel doesn’t speak English well, so there was an even greater challenge for the director working with his American and European actors. However, he used that alienated feeling in the film as one of many techniques to portray Vincent Van Gogh’s insecurity’s. A beautiful film no doubt, Schnabel accomplishes the same level of interest that Mike Leigh did with his portrait of British painter J.M.W. Turner in 2014’s Mr. Turner. Eternity’s Gate functions a bit like a Terrence Malick film (The Tree of Life, Song to Song), the camera wide eyed, going off into a visual tangent staring at the sky, trees, blurry images that eventually come into focus. The difference here is that Schnabel is trying to portray Van Gogh’s illness through visual representation. 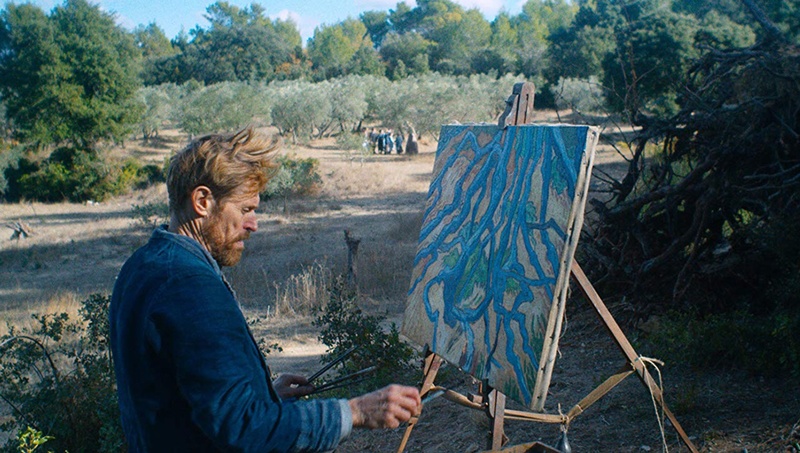 Frustrated with city life and those who don’t understand his work, Vincent Van Gogh (Dafoe) seeks solitude, heading to the quiet rural south of France. It’s there he will accomplish what came to be his life’s work and slip into the madness that prompted him to cut off his ear and eventually take his life. “Existence can’t be without reason,” he says to fellow painter Paul Gauguin (Isaac). There were few who understood Van Gogh’s method and style, even Gauguin encouraged him away from the fast, caked painting style. “Paint what’s in your mind,” he suggested. It was Theo Van Gogh (Friend) who could manage his brother most successfully, and is the man solely responsible for giving the artist the money and ability to paint what is today considered some of the most priceless works of art. Schnabel’s narrative of Van Goh’s story is abstract and while quite beautiful it rarely engages the viewer. There is a scene between Van Gogh and a shop owner (Emmanuelle Seigner), discussing Shakespeare and books. It becomes a conversation about art versus mainstream appeal and could mirror the debate between paying audiences and movie critics. “Is he a good writer,” she asks. He responds with an enthusiastic yes, admitting he doesn’t always understand the meaning of Shakespeare’s writing, but that he likes a bit of mystery in writing. She’s put off by this, saying she prefers to read things that make sense. It’s a brilliant, casual conversation that can be applied to any art film, but this one in particular. Schnabel’s narrative of Van Gogh’s story is abstract and while quite beautiful it rarely engages the viewer. You could take multiple bathroom breaks and not miss a thing. Golden hues from the sun spread yellow on everything if the specific production design for a particular scene isn’t already painted that way. It’s clear what color pallet he’s insisting the painters preferred. Dafoe’s performance captures the eccentricities of Van Gogh without leaning into sympathy, contempt or any sort of judgement. Coming off his supporting actor nomination for The Florida Project, CBS Films hopes to push Dafoe back into awards consideration, but I don’t think this is the type of performance than can crack the top five. The scene that elevates the movie beyond anything else, giving it purpose, occurs in the end with a priest played by Mads Mikkelsen. Van Gogh, forced to defend his occupation and works once more, delivers the most prolific words of the script. “Maybe God made me a painter to paint for those who are not born yet”. Eternity’s Gate leans heavily on the side of visual artistry to tell the story of Van Gogh, rather than more traditional cinematic elements.